My cousin is a chef. Yes, she can debone a rabbit and braise onions for hours but those skills pale when I think of the gift she gave me one night when no one wanted to cook. She suggested cheesy popcorn. “Cheesy popcorn? What is cheesy popcorn?â€ I asked, eyes wide. 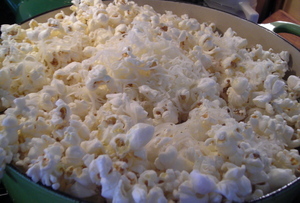 I love popcorn and I love cheese and the two together struck me as an excess of riches. “I will show you.â€ And 15 years ago, show me she did. It is still my favorite dinner when the day has been long and drawn out, and the creative cooking juices are at their lowest ebb. It takes 10 minutes to prepare, it is super easy, and the quality of the final product rests on one thing - how much good cheese you want to grate. 4. 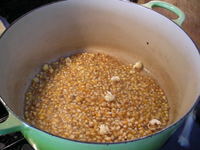 Once you hear the three kernels pop, pour in enough corn to be coated liberally with the oil. Put the lid back on. 5. Continue to grate. The more cheese you grate the more decadent your popcorn will be. Take a moment to shake the pot, return to grating. 6. After the corn has stopped popping, open the lid - a flash of steam and popcorn smell will envelope you as you sprinkle the delicate cheese onto the warm kernels. 8. Turn onto your big bowl and devour the simple meal (add an apple for balance if needed).